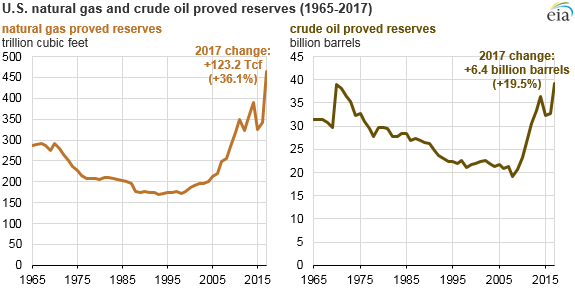 Proved reserves of U.S. crude oil increased 19.5 per cent from the end of 2016, reaching 39.2 billion barrels and surpassing the previous peak level of 39.0 billion barrels set in 1970. Getty Images photo by Andreas Rentz. This article was published by the US Energy Information Administration on Nov. 29, 2018. Proved reserves of U.S. crude oil increased 19.5 per cent from the end of 2016, reaching 39.2 billion barrels and surpassing the previous peak level of 39.0 billion barrels set in 1970. Proved reserves of natural gas increased 36.1 per cent from the end of 2016 to reach 464.3 trillion cubic feet (Tcf) in 2017, surpassing the previous record of 388.8 Tcf set in 2014. Changes in proved reserves from year to year reflect new discoveries (in new fields, new reservoirs in old fields, or extensions of existing reservoirs), net revisions and other adjustments to previous reserve estimates, and reductions from annual production of each fuel. Higher fuel prices typically increase estimates as operators consider a broader portion of the resource base economically producible. In 2017, the annual average spot price for the benchmark West Texas Intermediate (WTI) crude oil increased 20 per cent from the 2016 average price, exceeding $60 per barrel for the first time since June 2015 and helping to drive increases in reserves. Texas and New Mexico had the largest net increases in proved reserves of crude oil in 2017, adding 3.1 billion and 1.0 billion barrels of proved crude oil reserves, respectively. Increases in these states were primarily the result of increased crude oil prices and development in the Permian Basin, particularly in the stacked oil-bearing formations of the Spraberry Trend and the Wolfcamp/Bone Spring shale play. The annual average spot price for natural gas also increased in 2017. Natural gas prices at Louisiana’s Henry Hub increased 21 per cent in 2017, helping to drive increases in natural gas reserves. Pennsylvania added 28.1 Tcf of natural gas proved reserves, the largest net increase among states in 2017, as a result of increased prices and development of the Marcellus and Utica shales in the Appalachian Basin. Texas had the second-largest net increase in natural gas proved reserves, with the largest portions of the increase coming from the Wolfcamp/Bone Spring shale play in the Permian Basin and the Haynesville/Bossier shale play in eastern Texas and northern Louisiana. The share of natural gas from shale increased from 62 per cent of total U.S. natural gas proved reserves in 2016 to 66 per cent in 2017. Source: U.S. Energy Information Administration, U.S. Crude Oil and Natural Gas Proved Reserves Note: Click to enlarge crude oil and lease condensate and natural gas maps.